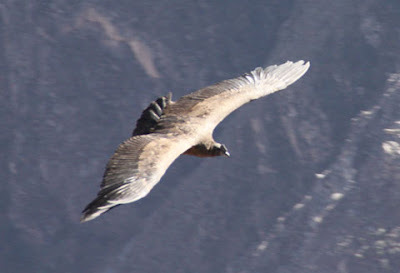 Condors with a wing span up to 10 feet glide through the mountain pass from both sides of Colca Canyon in the Highlands of Peru. We watch these gigantic birds put on a spectacular show from our perch on a rock wall rising up from the canyon. Only later do we learn some interesting facts: Condors can live up to 150 years and, most surprisingly, they eat only dead animals, scavenging wherever they can. We’re at a spot called Cruz del Condor or Condor’s Cross, a natural lookout on the edge of the canyon. At an elevation of 10,784 feet, it is an excellent place to watch condors soar gracefully on rising thermals formed when warm currents rise from the canyon floor. No one can predict exactly when or how many condors may perform their aerial show on any given day, but the largest crowds come to view the spectacle early in the morning when the majestic birds are hunting for food. The valley offers stunning views of the Andean landscape. 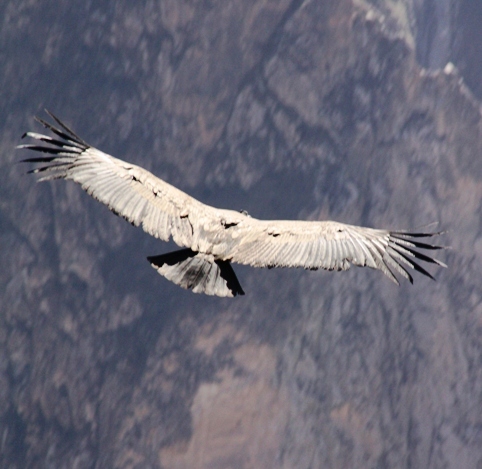 It’s a popular location for hikers, backpackers, and mountain bikers, but what entices most people to this region is the opportunity to see the powerful Andean condors in flight. We also marvel because it’s where the mighty Amazon River begins. Colca River starts high in the Andes Mountains of Peru and flows to the Pacific Ocean in stages, forming a scenic canyon twice as deep as the Grand Canyon. Snow-melt from the 16,800-foot high volcano Mismi is a distant source of the Amazon. 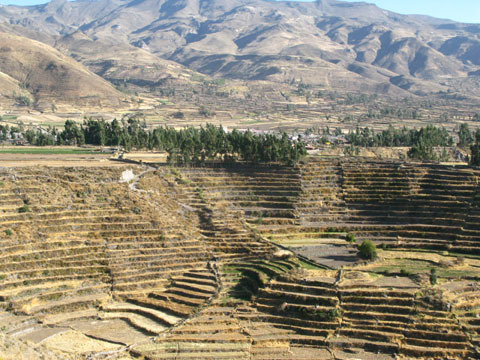 Terrace farming originated by the Incas is still practiced today. 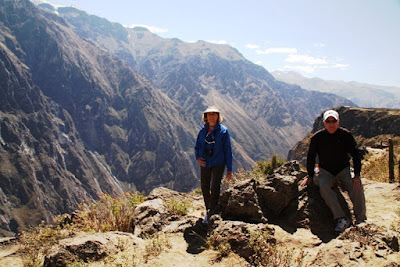 Terraces built by Inca and pre-Inca cultures are still cultivated along the canyon walls, and the name Colca refers to small granaries built into the cliffs that were used as storage for potatoes, quinoa, and other crops grown on the terraces. Walking along the canyon rim. We take a short hike along the canyon’s rim. Looking at down into the valley and across the canyon we spot several backpackers trekking on the rugged, often barren trails. But we walk easily among wildflowers on our overlook trail before returning to Colca Lodge, our hotel oasis where natural hot springs welcome us back to civility. Peru is an increasingly popular destination for U.S. travelers. The road to Cruz del Condor in Peru. With bustling cities like Lima and Arequipa, historic attractions such as Cusco and Machu Picchu, a varied geology that includes volcanoes and the Andes Mountain, native cultures of the Highlands region, an expanding culinary scene, and the enormous Amazon River, Peru is one of our favorite destinations in South America.